Numbers are a big deal around here right now. What we liked about math game was that even though we made it a little complicated, you could easily simplify it for even younger kids ( simply write numbers out and have them find the ones you call out)or more challenging for older more advanced mathematicians. (Have them find 2 at a time and add together). Our goal for numbers right now is to work on counting things to discover the amount and match that amount with the numbers he already recognizes. 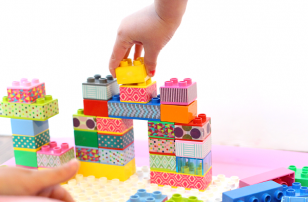 If your child’s goal is different adjust as needed! Gather your materials. 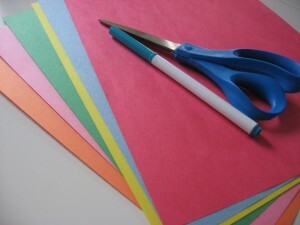 You will need some different colored paper, a marker , scissors ( we actually ripped the paper) and some floor space. 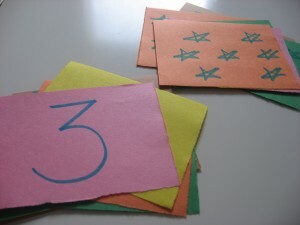 Start by folding your paper in 4, so that 2 numbers will both be that color. This just makes it easier, I am using the colors as a clue to help my son but not give away the answer either. Write numbers in one square and make the corresponding amount of drawings in the other. Place either the papers with the numbers or the ones with the numbers around in a circle face up. 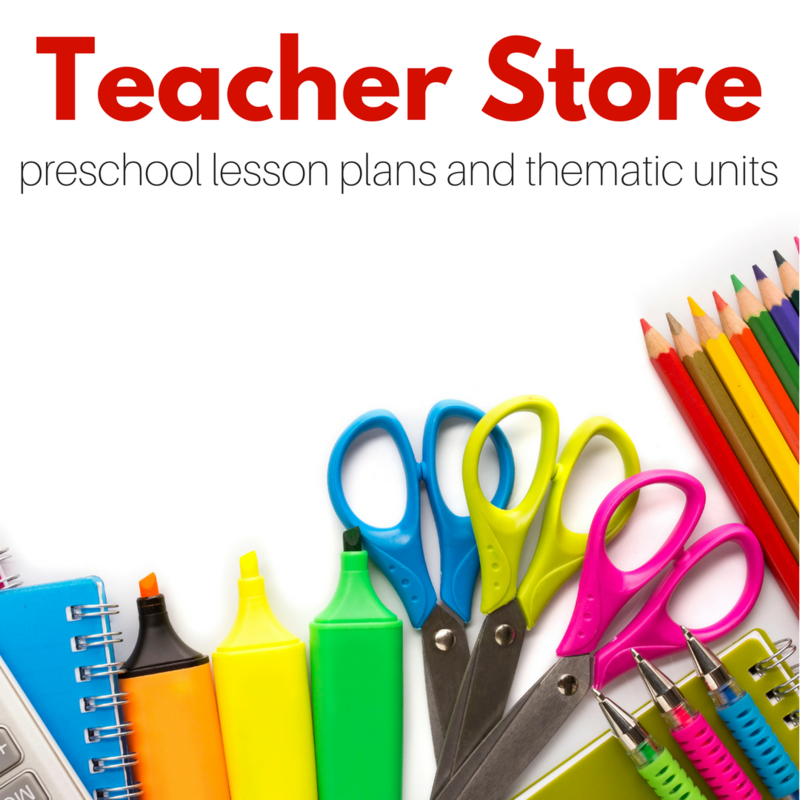 Fan out the others in your hand and invite your child to choose one by asking for the color. Hand it to them, if it’s a number ask them to identify it and find it’s match. For the lower numbers my son grabbed the right one immediately, for larger ones he would grab the matching colors then we would count them together to discover which was the correct match. 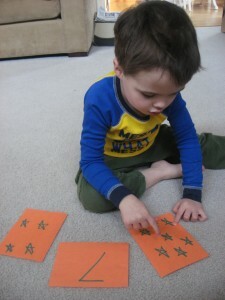 I had to help him touch each star on the larger numbers so that he wouldn’t count them twice, this just takes time and good modeling so don’t get frustrated or worried if your child does hit, just lead by example. 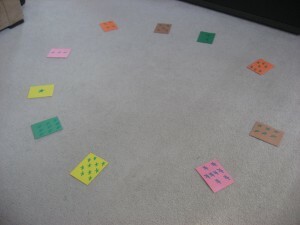 We played the game 2 times once with the numbers in the circle , once with the stars in the circle – learning is hard work, so we had to pretend to be a clock after! 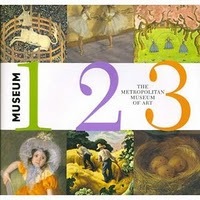 Museum 123 by The Metropolitan Museum Of Art is another simple but beautiful counting book. What I love about this book is that the number is not on the same page as the onbjects/images the child is being asked to count. Instead a simple question of how many is followed by a painting with the objects, and the next page has a large number. My son loved counting then flipping the page exclaiming ” I knew it , I said that number I was right!” My only complaint is that it only went to 10! Edited for 2010 : I wrote that review nearly 2 years ago. The other day at the library my son grabbed the book and begged to read it again. At 3 he still loved the book and I still give it a huge thumbs up! One, Two, Three by Tom Slaughter is super simple, bold, bright and a great counting book! 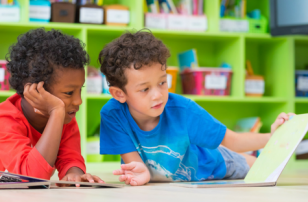 These aren’t complex books, pictures matter because they should encourage the reader to want to count and connect the number they have counted with the number printed on the page. I would happily recommend this book to families with babies through preschoolers , my 3 year old loved it and partly because he read all the pictures and numbers himself! Construction Countdown is big hit at our house too! My guy can count to 10, but we’re still working on number recognition. 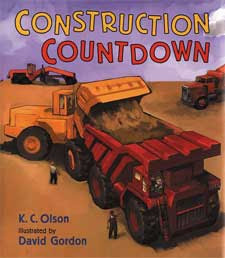 Sometimes the backwards counting aspect of the book throws him off a little, but he LOVES the construction trucks! I’m trying to incorporate more number recognition activities into our week. This matching one seems so easy! .-= Cara´s last blog ..Make Ahead Crisp Buttery Garlic Bread =-. I really like how you made the colors a tool for his benefit. Art can be used to help teach so many things, and this project is a brilliant illustration of that. I can’t wait until my son is a little older so we can start playing some of this type of game! 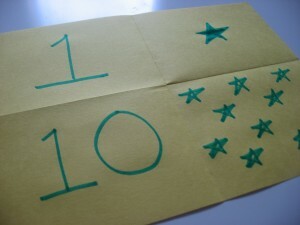 I love the number matching ideas! We really need to work more on numbers we tend to focus so much on early literacy I forget about other areas of learning! 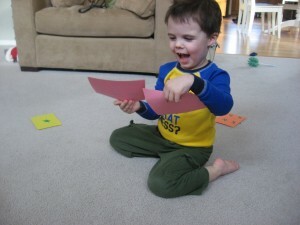 Thanks for a great, simple activity! 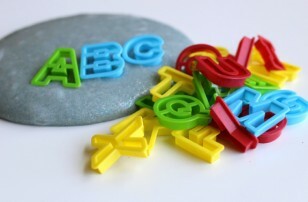 .-= Rachel´s last blog ..Magnetic Words: Great Way to Teach Site Words to Preschoolers =-. I love the number matching idea. We really need to work more on numbers we tend to focus so much on early literacy I forget about other areas of learning! 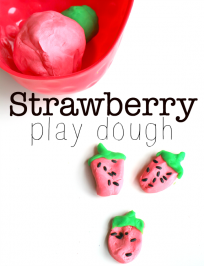 Thanks for a great, simple activity! .-= Staci´s last blog ..Update on Energizer Battery Deal =-. I wrote up a post on my blog about the numbers games we’ve been playing too. 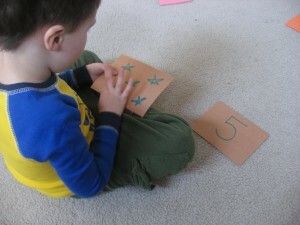 Kinesthetic number games seem to be winners in our house too. 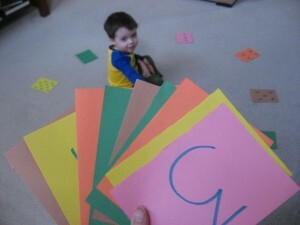 .-= Elise´s last blog ..Counting Games For Kinesthetic Learners. =-. This looks like a great idea. I know my daughter will love this. She has been very much into numbers and couting lately. Thanks for another great idea! How cute is that??? Very simple and clever. I’m going to try this one. Aww thanks! I just asked him why I take pictures and he said : ” To show other kids mommies how to play.” he knows we have a blog and likes looking at the pictures. 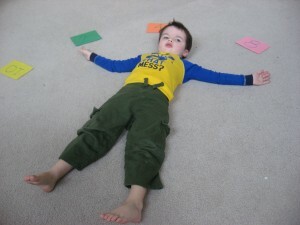 Not sure if I made a performer because of it or just happen to have one – but he’s got mama’s flair for the dramatic ! I love your ideas, they are so simple but great. Perfect for my 3 year old. Thanks for posting! 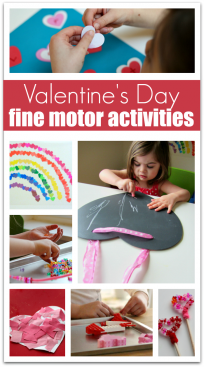 .-= Molly´s last blog ..Craft with me 1, 2, 3…..Celebrating Dr. Seuss’s birthday! =-. I linked to this (and your list of math games) on my weekly roundup – the post is under my name. Thanks for sharing! 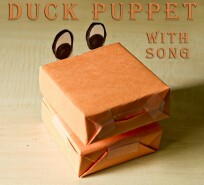 .-= Lenetta @ Nettacow´s last blog ..Link Roundup – Bribe Edition =-.